Arias: Daniel Jacobs Overrated, Wasn't a Legit Champion at 160! Luis Arias doesn’t see Daniel Jacobs the way most boxing observers view the hard-hitting middleweight from Brooklyn. Milwaukee’s Arias doesn’t think the man he’ll face November 11 is an elite middleweight. And Arias definitely doesn’t consider Jacobs a legitimate former middleweight champion. Arias also made reference to Jacobs winning the WBA world middleweight title by beating Australia’s Jarrod Fletcher in August 2014. That shouldn’t really count, according to Arias, because everyone knows Gennady Golovkin has long been the WBA’s real middleweight champion. The 30-year-old Jacobs (32-2, 29 KOs) lost his last fight for Golovkin’s middleweight titles by unanimous decision, but gained respect worldwide for getting up from a fourth-round knockdown and giving Golovkin arguably the most difficult fight of his career March 18 at Madison Square Garden. Former WBO champion Dmitry Pirog stopped Jacobs in the fifth round of Jacobs’ first middleweight title fight in July 2010. 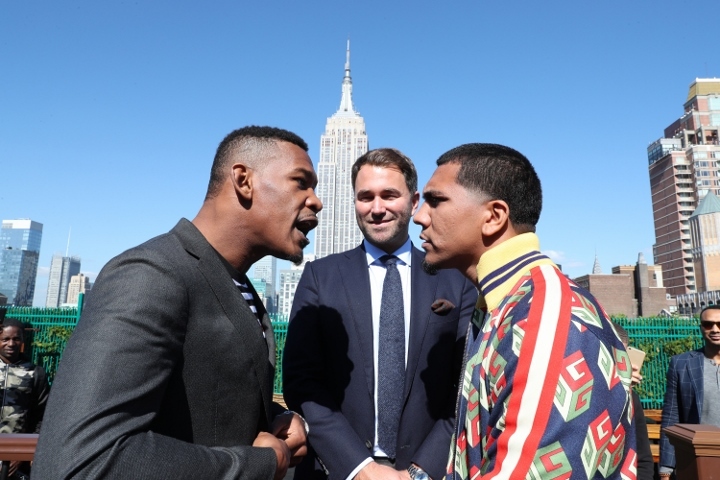 Arias acknowledged Jacobs is a “good fighter” after questioning the cancer survivor’s credentials. HBO will televise Jacobs-Arias as the main event of a “World Championship Boxing” tripleheader November 11 from Nassau Veterans Memorial Coliseum in Uniondale, New York. Dudes talking out of his a ss. He’s gonna get laid out by Danny Jacobs.